Humidity levels over 50 percent can result in negative health conditions from the growth of mildew and mold and can damage items like books or clothes all while leaving a musty odor. That is why you want the best dehumidifier to help maintain the ideal humidity of around 40-50% in places such as basements, crawl spaces, bathrooms, closets, garages, apartments, or safes. Dehumidifiers are rated on their capacity which is number of pints of moisture removed in a 24 hour period. In extremely wet or extremely large areas you will want large capacity machines rated for 60 pints or more. In smaller rooms or less damp spaces, a 30-pint unit might be satisfactory. Some features you should look for, in addition to the capacity, if you are buying a new model are user-friendly controls including desired humidity levels, constant drainage with hose connection or an easy-to-empty tank, auto shut-off, auto restart, defrost, timer, and wheels or castors to easily move the machine on heavier models. 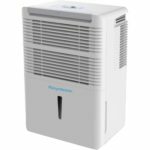 We looked at dozens of models and user reviews to come up with our list of the top 10 best dehumidifiers which we review below. Other than our choice for number one, we tried to focus on models that were available for less than $300. 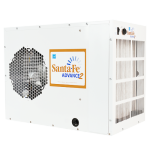 The best dehumidifier for crawl spaces or basements is the Sante Fe Advance2 which sells for $1380. This made in America unit scores high marks from nearly all users while removing 90 pints of moisture per day and covering any space up to 2600 square feet. In extremely damp, high humid environments it can remove up to 180 pints of moisture per day. It is designed to sit horizontal which creates a smaller, more compact profile to fit into small spaces. The Advance2 meets EnergyStar requirements and comes with all the features you could want like a drain hose, humidity knob control, automatic defrost, independent fan control, and auto restart. One negative is that it is the loudest model on our list with a max noise of 64 decibels. We highly recommend this Sante Fe model for people with large basements and crawl spaces with extremely high humidity. For those of you who want to just dehumidify a small space or one room like a bathroom or closet then this unit would exceed what you would need and you should choose a cheaper option. The best 70 pint dehumidifier is the best-selling Frigidaire FFAD7033R1 which is priced at $250. The FFAD7033R1 boasts effortless operation with convenient humidity controls, full tank alert system with automatic shutoff, continuous drain option, auto defrost, and auto restart if the power goes out. Thanks to castors and a top handle it is also one the easiest units to move around if needed. This Figidaire model can remove 70 pints of moisture per day in room sizes up to 1300 square feet which is more than enough for most basements. At just 51 decibels it is also relatively quiet. We highly recommend the Frigidaire FFAD7033R1 since it has all the features users need, is portable, and is capable of dehumidifying large areas. 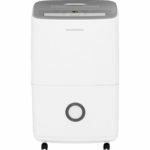 We feel the best dehumidifier under $200 is the $199 Danby Premiere DDR70B3WP. (Note: This model is normally priced higher than $200, but we have seen it on sale for as low as $199.) This newly redesigned model is nearly equal in performance and features as the Frigidaire with smart dehumidifying technology that automatically maintains the desired humidity level based on ambient humidity and room temperature. Other features include full bucket auto shutoff, auto defrost, 24 hour timer, and automatic restart on power outage, The DDR70B3WP is also the quietest dehumidifier on our list at just 50 dB. 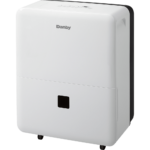 Overall there are no real weaknesses on the Danby Premiere DDR70B3WP and it is a great choice for anyone looking for a cheap 70 pint dehumidifier that can handle a large space of up to 1200 square feet. 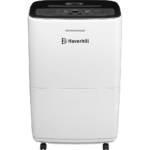 The best cheap dehumidifier is the Haverhill HD5020E 50-pint dehumidifier which sells for $155. The cheapest model on our list, this unit can remove up to 50 pints of water per day in a room up to 800 square feet. Simple controls give you the ability to set the desired humidity level and select from one of four operating modes – continuous, sleeping space, living space, or basement. Other features of the HD5020E include full buck auto shutoff, 24 hour timer, auto restart, plus casters and a carrying handle for easy portability. You won’t find a cheaper unit that is in the 50-pint range that performs as good as the Haverhill HD5020E which is why we highly recommend it for those of you looking for the best value. Another affordable 50 pint model is the $165 Keystone KSTAD50B. The leading consumer magazine rated this dehumidifier as a Best Buy and gave it their highest rating. It gets high praise for its very accurate humidistat and cool room performance which works well in rooms up to about 800 square feet. Other features include auto shutoff, auto restart, and rolling castors. One common complaint about the KSTAD50B is that it is hard to remove and empty the 7.3 pint bucket without spilling some of the water. If you hook up a drain hose and let it continuously drain then this would not be an issue. It is also slightly louder than some other models at 55 dB. Overall the performance of the Keystone KSTAD50B is great, especially in cold rooms which some other models can struggle with. Our top-rated 30 pint dehumidifier is the Frigidaire FFAD3033R1 which sells for $169. This 30 pint model offers the same user-friendly effortless control features like the other new Frigidaire dehumidifiers including humidistat control, full tank auto shutoff, delay timer, auto defrost, and auto restart. It is sleek looking and compact at 20.5″ x 13.8″ x 10.5″ with carrying handles and rolling castors for easy portability. The FFAD3033R1 is capable of removing 30 pints of water per day from a room size up to 400 square feet. This makes it an ideal unit for smaller areas like bathrooms, laundry rooms, or bedrooms. Another quality 30 pint dehumidifier is the $189 Danby Premiere DDR30B3WP which we have actually seen on sale as low as $155. Newly redesigned in 2015, the DDR30B3WP works well in rooms up to 400 square feet to reduce moisture. 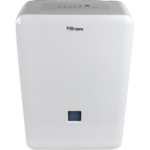 The automatic controls offer what Danby calls “Smart Dehumidifying” which lets the unit decide the proper humidity levels for you with just a press of a button. There are also continuous and manual settings you can set to control exact settings if you prefer. The DDR30B3WP also has all the popular features that any user could want like auto shutoff and auto restart. Overall we really like the performance of the Danby Premiere DDR30B3WP, but it is a bit on the expensive side compared to some other 30 pint and larger models. The Frigidaire FFAD5033R1 is Frididaire’s newest 50 pint dehumidifier and costs $199. It is in the same family as the other Frigidaire models on this list and thus has the same user-friendly features and controls. This unit, however, can remove 50 pints of water per day from rooms up to about 800 square feet. There is nothing really wrong with the Frigidaire FFAD5033R1, in fact it works really well, but with a price of $199 we feel there are better values available in the 50 pint range. The Danby DDR60A3GP – normally $289, but we have seen it on sale for as low as $229 – is great for large basements and extracts up to 60 pints per day in spaces up to 1000 square feet. This model is unique because it has an internal condensate pump for pumped drainage instead of the normal gravity drainage. This lets you pump the water wherever it needs to go to drain including upwards. Controls are simple – just set your desired humidity level and the machine maintains that level by turning the compressor on and off. A negative that some buyers have complained about is that the fan on this unit never shuts off even if the compressor is off. Also, since it has a pump on the DDR60A3GP, it consumes a lot more energy than other models which will result in higher electric bills. 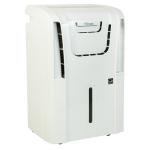 If you want a dehumidifier with a built-in pump than the Danby DDR60A3GP is a great choice. 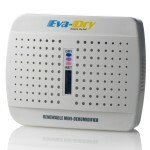 If you need a mini dehumidifier to put in a safe or other small space, then we recommend the Eva-Dry Renewable E-333 which can be had for less than$15. It requires no power source during use and has a lifespan of 10 years. It contains silica gel crystals that change color as they absorb moisture, once it has reached its capacity you plug the unit in somewhere to release the moisture and after 8-10 hours it is ready to be used again. Users should remember the Eva-Dry Renewable E-333 is not meant for a full-sized rooms. Its best use is for safes and closets.